The back: Pettini also takes issue with the back of this card. "That's the other thing: how in the hell did that ever get on there? I played the saxophone when I was like 6 or 7. I haven't picked it up since then, but I do play the guitar and a little bit of piano." 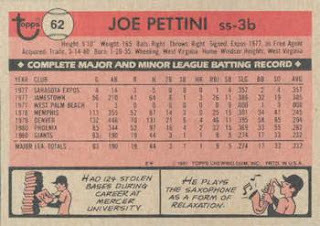 The player: Pettini played in parts of four seasons in the majors for the Giants, hitting .203 with 1 HR and 20 RBI in 188 games. The man: Pettini was Tony LaRussa’s bench coach on the Cardinals’ 2006 and 2011 World Championship teams. He now appears to be retired. My collection: I have six of his cards, from 1981 to 1984. 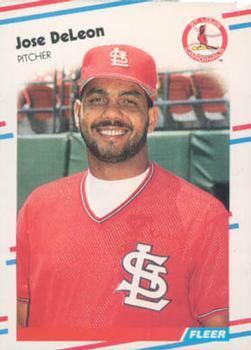 I would be interested in trading for 1985 Riley’s Louisville Redbirds #12. The first Thom McAn store opened in New York in 1922. Named after a famous Scottish golfer, the chain peaked at almost 2,000 locations nationwide before declining in the 1980s and 1990s. 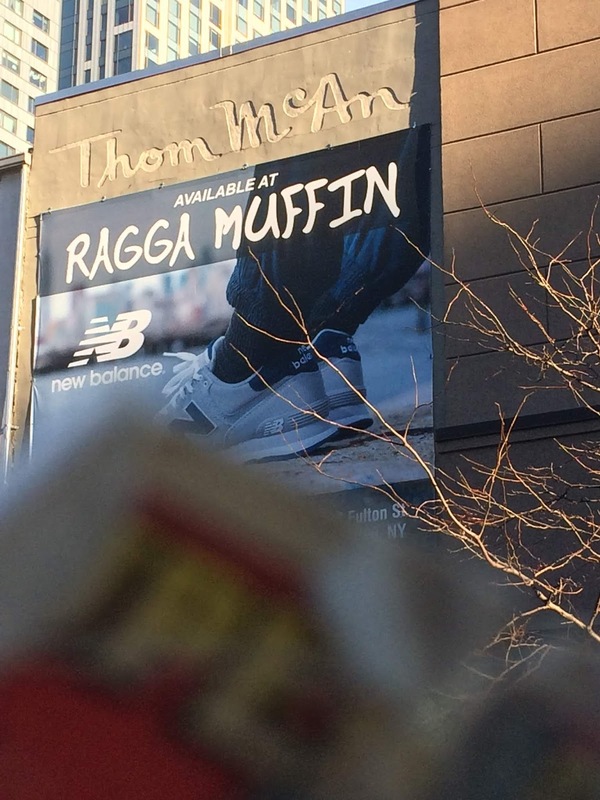 The last Thom McAn store closed in 1996, though shoes with the brand name still sell in other outlets today. 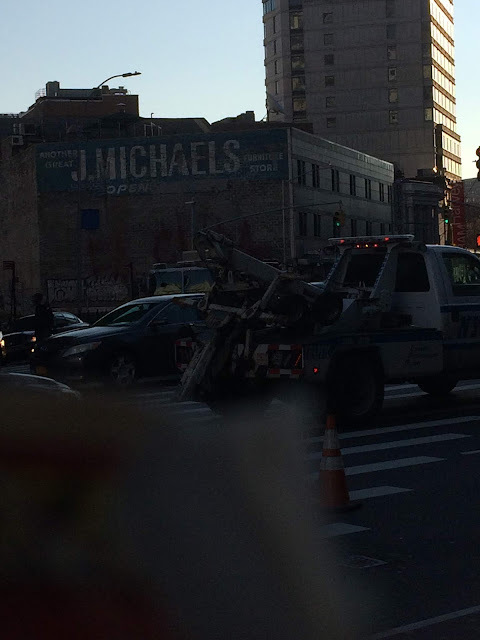 Old Thom McAn signs can still be seen at their former locations thoughout the country, including this large one in Brooklyn. The front: Wynegar having a laugh at Yankee Stadium. 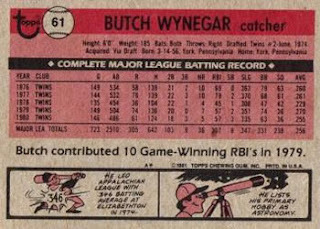 The back: I found nothing online about Wynegar’s astronomy hobby. Perhaps Topps made it up? You will see that Topps sometimes did that with the next card in this set. Does this count as a night card? The player: Wynegar was an excellent fielding catcher with a little bit of pop in his bat. In 1976 he was the youngest ever All-Star (20 years, 212 days), and finished behind just Mark Fidrych in the Rookie of the Year voting. 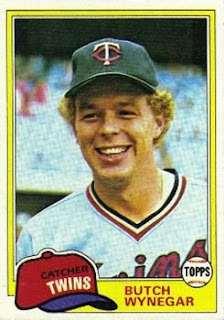 He was solid for a while in Minnesota, but after starting the 1982 season hitting .209, he was traded to the Yankees. 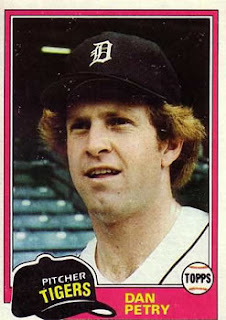 Wynegar did not adapt well to the stresses of playing in the Bronx, and left the team in mid-season 1986. He returned to baseball for the Angels, retiring in 1988. Overall he hit .255 with 65 HR and 506 RBI in 1,301 games. The man: Wynegar stayed in baseball after his playing days, coaching for various minor league teams, even returning to the Yankees organization, now far better run, for seven years starting in 2007. He is currently a minor league hitting coach in the Pirates organization. My collection: I have 33 of his cards, from 1977 to 1989. 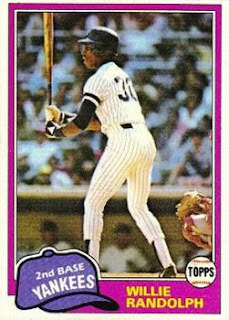 I would be interested in trading for 1982 Topps Traded #131. The front: Nice photo of Randolph at bat at Yankee Stadium. Looks like it might be a Red Sox catcher behind him. Fisk? The player: Randolph was one of the best second basemen in Yankees history. 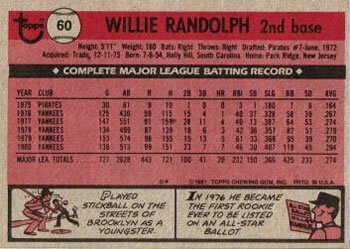 At the time of his retirement he ranked in the top-10 all time in most defensive categories for AL second baseman. He was also an excellent hitter, with a .276 batting average in an 18-year career at a time when few second baseman were accomplished hitters. The man: Randolph is considered an excellent baseball man and community ambassador. He was a long-time Yankees coach and managed the Mets from 2005 to 2008. Randolph still works with the Yankees as a spring training instructor. My collection: I have 116 of his cards, from 1976 to 1993. 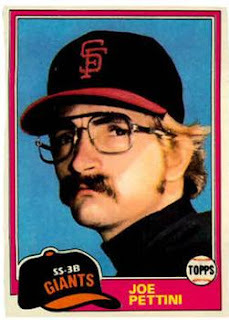 I would be interested in trading for 1976 Topps #592. J. Michaels sold furniture at several Brooklyn locations from 1886 to 1996. The front: Simple head shot at Tiger Stadium. The back: On July 13, 1979, Petry beat the White Sox for his first major league win. 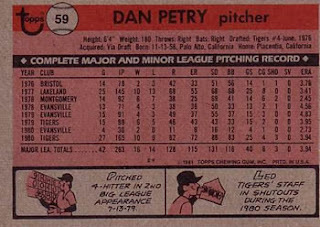 The player: Dan Petry was one of the Tigers’ best pitchers in the early 1980s, twice finishing in the top 10 in Cy Young voting. 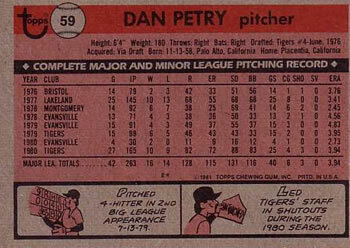 In 1986 Petry got hurt, underwent surgery on his elbow, and was never the same. Overall in 13 seasons he went 125-104 with a 3.95 ERA. The man: Petry is now an announcer for the Tigers. His son Jeff plays in the NHL for the Montreal Canadiens. My collection: I have 45 of his cards from 1980 to 1992. I would be interested in trading for 1985 Fleer Star Stickers #83.